Why Do Young Children Draw Belly Buttons? 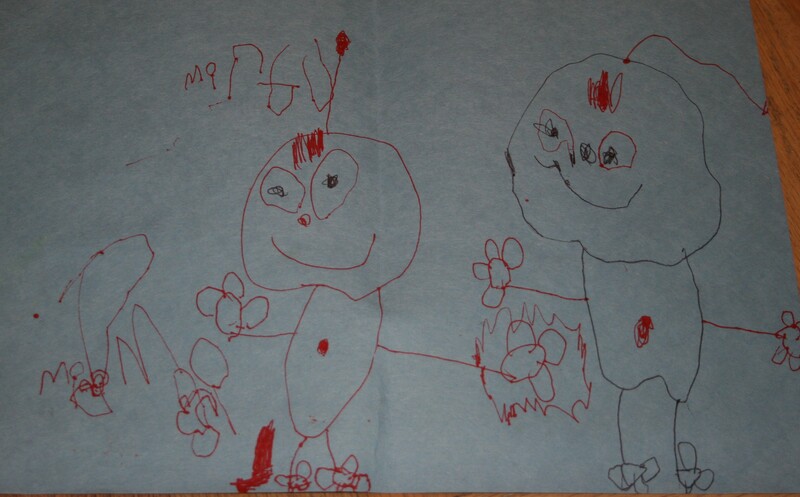 My youngest daughter (age 4) has recently started to draw detailed pictures. Mostly they are people. She always starts with the eyes, adds a nose and mouth and then draws the circle for a head. 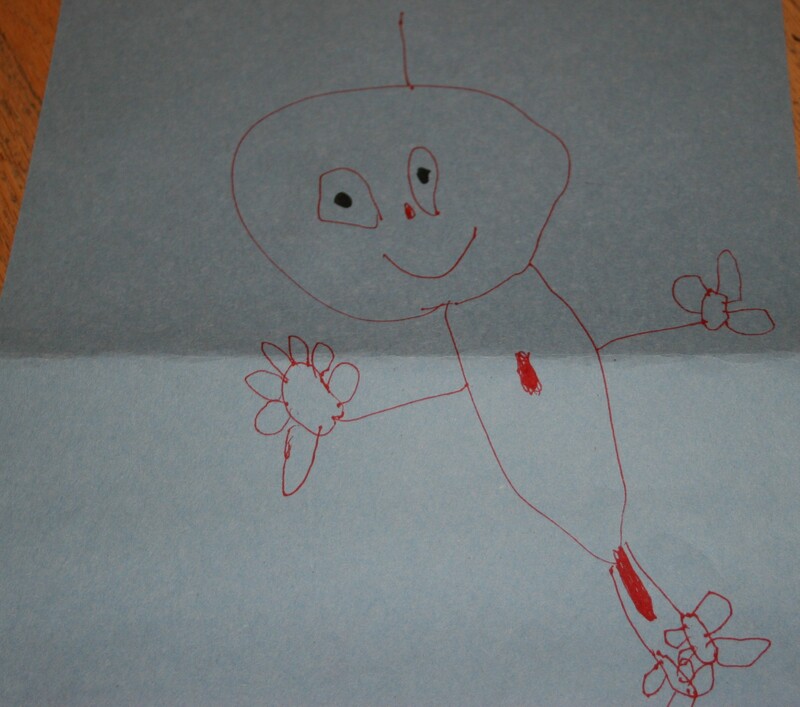 After adding hair, she draws a torso, arms, legs, hands and feet. The finishing touch is always a belly button. I found this fascinating. I don’t remember my older children doing this for any sustained period of time, if at all. 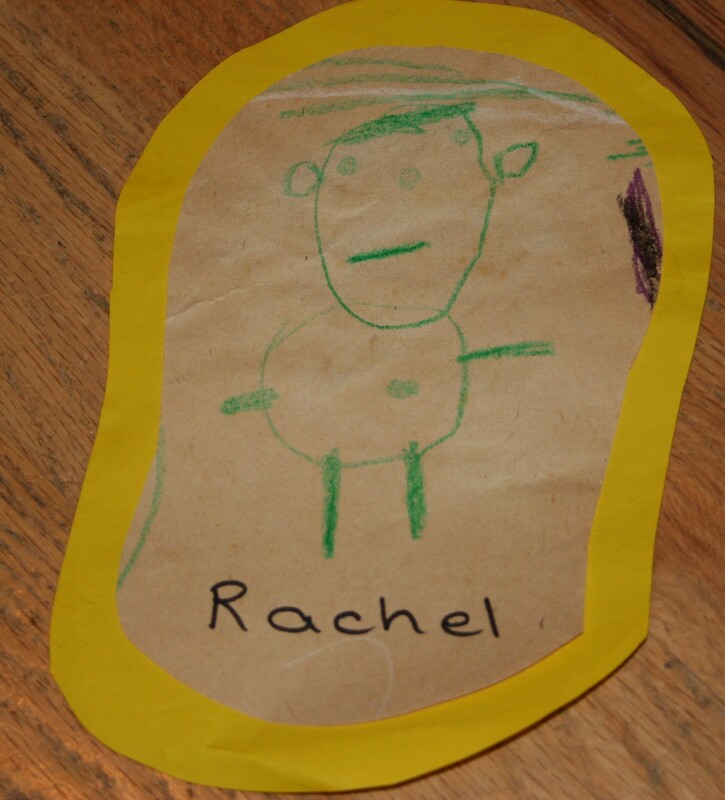 In the earliest stages of children’s drawings of people, there is no torso. At this stage they often draw a navel (or circle) between the legs to depict that there is a torso there. I’m not so familiar with children drawing belly buttons onto a torso however. Clearly, children under the age of 5 do not generally draw clothes on their people. Seeing a navel on her sister’s drawing, immediately led my 6-year old to the assumption that it was naked. 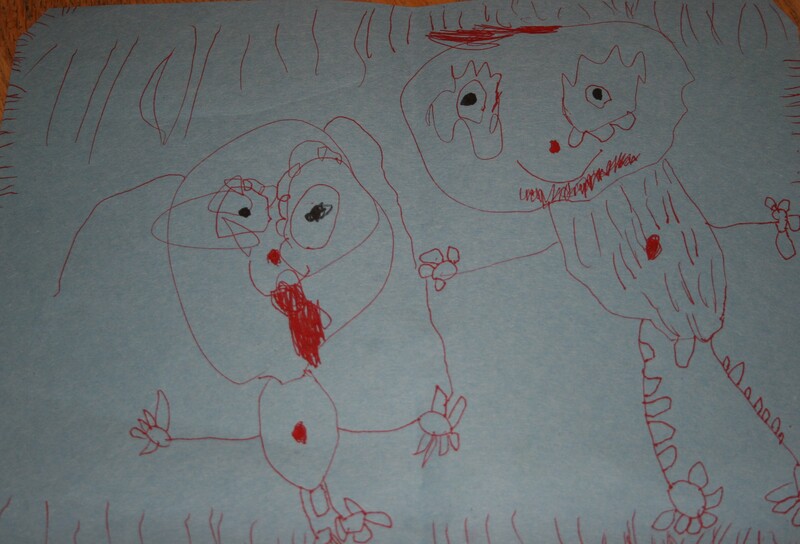 As they talked through the drawing together, the picture became one of a daddy and his little girl in the shower and anatomically correct details were added. These didn’t survive into later drawings when her sister was not present but the placement of the belly button continued. 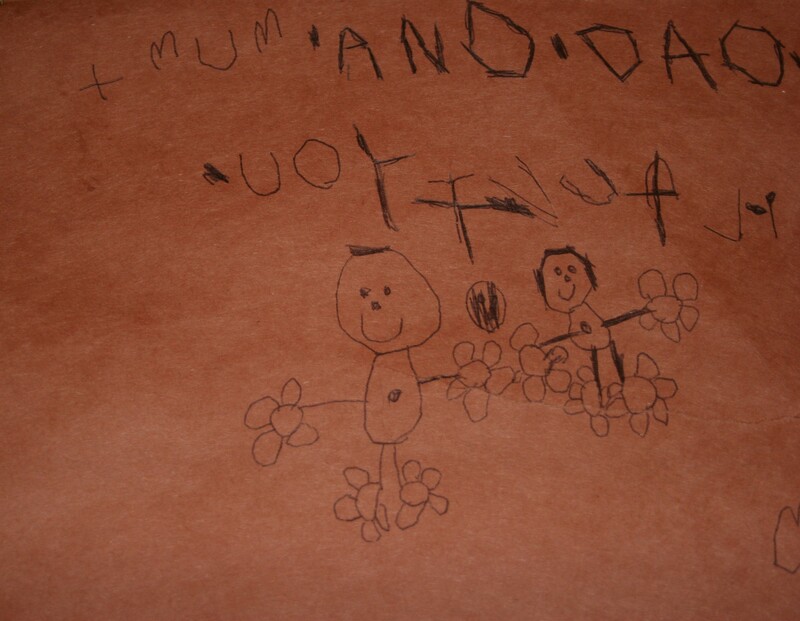 My intrigue grew, when a friend with a child of a similar age shared her daughter’s drawing of the family. There was the belly button again. I decided to ask an expert and consulted Ursula Kolbe author of Rapunzel’s Supermarket:All about Young Children and Their Art for help. She suggested that children are fascinated by belly buttons and the drawing of a simple round shape is often intensely satisfying. Perhaps then, it is the circles that she finds fascinating. The drawing sequence always begins with eyes made up of a circle within a circle. Kolbe also suggested that children often copy the ideas of other children but since my little one is yet to attend preschool and only has her sisters to influence her this is unlikely in her case. Often what children include or don’t include in their drawings is determined by the sequence in which they draw. “If a child draws a torso and then legs they sometimes won’t go back up to include a navel even if they intended to do so” says Kolbe. I watched my daughter’s sequence with interest; she always drew the whole person and then went back to draw the navel as a finishing touch. Sorting through boxes, I came across some old photographs of me as a child. In amongst them was this. I must have been 4 or 5 years old when I drew this man, complete with belly button. What a magnificent and timely discovery to help solve my conundrum. Previous PostHallowe’en Songs for Pre-schoolers.Next PostHow to Teach 2-Year-Olds: Advice for Teachers Who are New to this Age Group. We see lots of these in our classroom. 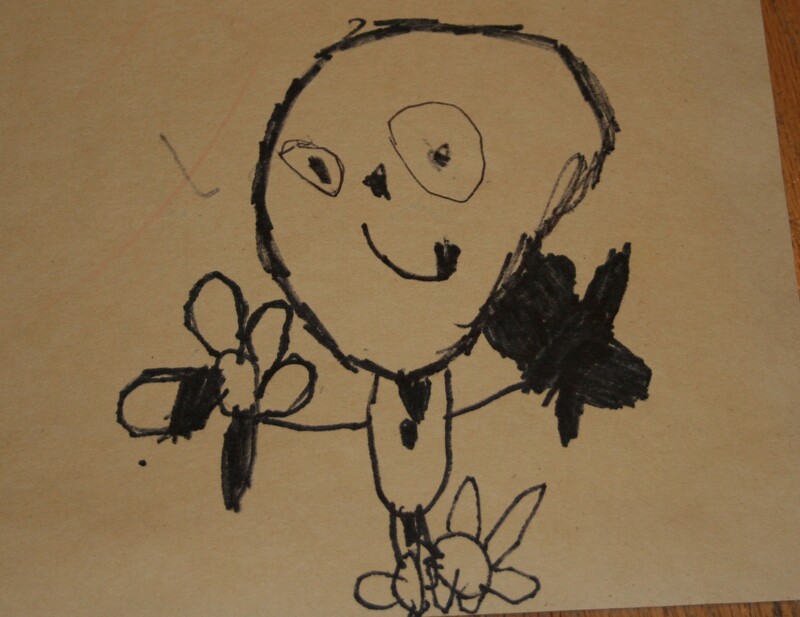 Do you see belly buttons popping up all over your child’s drawings? ☺ Love those belly buttons!